Temps were on the chilly side as we gathered at the Kanan Road trailhead for Backbone Ultra Training Run #2. I think someone said 28 degrees. It must have been that cold. Not only were the trailhead sign coated with ice and garbage can lids frozen shut, among the 20+ runners there wasn’t a bare arm in sight. At first there was so much frost it was hard to distinguish between the frost and the pandemic bloom of bigpod Ceanothus covering the hills. Even so it didn’t take long to get warmed up and enjoy some excellent running on one of the more scenic sections of the Backbone Trail. The title photo is a view northwest along Etz Meloy Mtwy at about mile 47 of the Backbone Trail. The highest peak on the skyline, right of center, is Sandstone Peak. 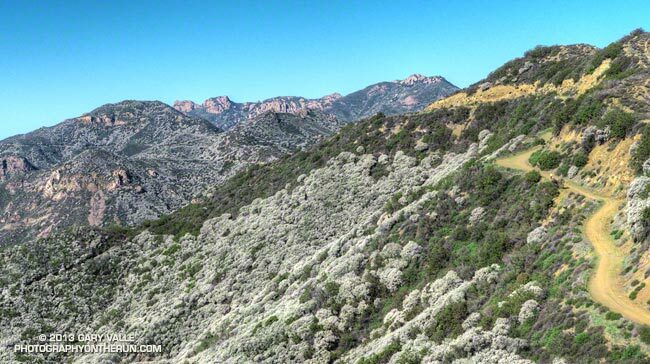 Sandstone Peak marks the high point of the Backbone Trail and the start of an approximately 7 mile long, 2700′ descent into Sycamore Canyon. Here’s a view southeast from the same vantage point along Etz Meloy. 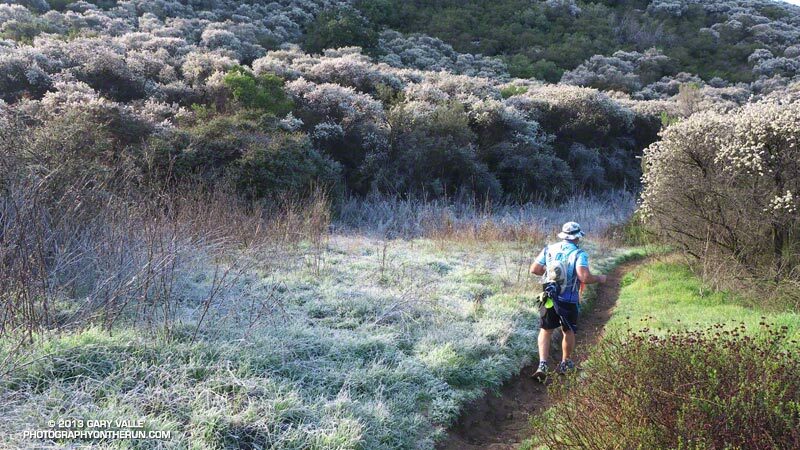 The runners are about 9 miles from the Kanan Road trailhead and have just done a moderately graded climb from Trancas Canyon, gaining about 1200′ over about 4.5 miles. For more photos and info see the Coyote Backbone Trail Ultra web site and Facebook page.